The pioneering wristwatch to showcase a date aperture on its dial was none other than the Oyster Perpetual Datejust. It was unveiled in 1945 and it had many features that were perfected by Rolex such as automatic winding, water resistance, as well as chronometer accuracy. Initially, the Datejust was only available in gold but few years later they produced them in steel as well. There were many improvements to the Datejust over several decades and in 1954, the Cyclops was added to the dial. Rolex fans know that its function is to magnify the date to make it more visible. 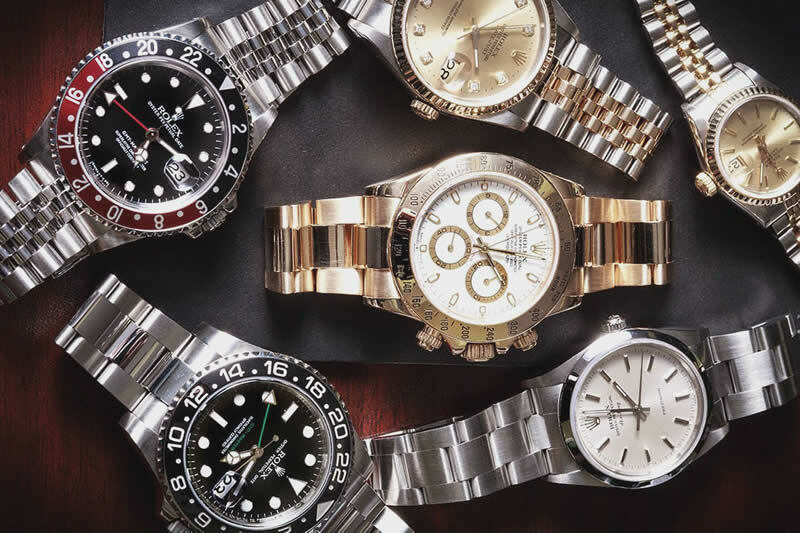 A year later, in 1955, Rolex added an instantly changing date. By 1977, they upgraded its movement to Caliber 3035 which had red oxidized reverser wheels that offered very minimal friction. This movement was used until the late 80s when it was improved to the 3135 which had an improved automatic winding system and a balance bridge. 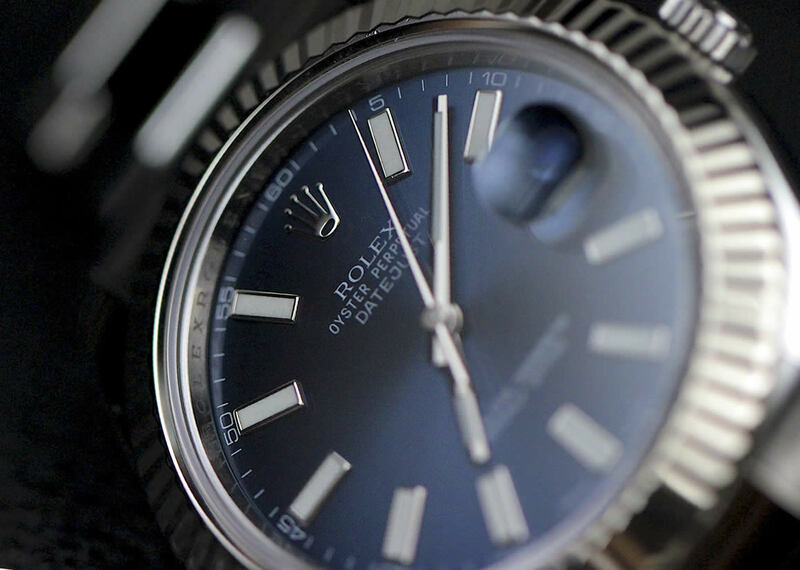 The case of the Rolex Datejust however remained the same – 36mm. Later on the company offered smaller 31mm and 26mm cases but were still primarily leaning towards larger case sizes. 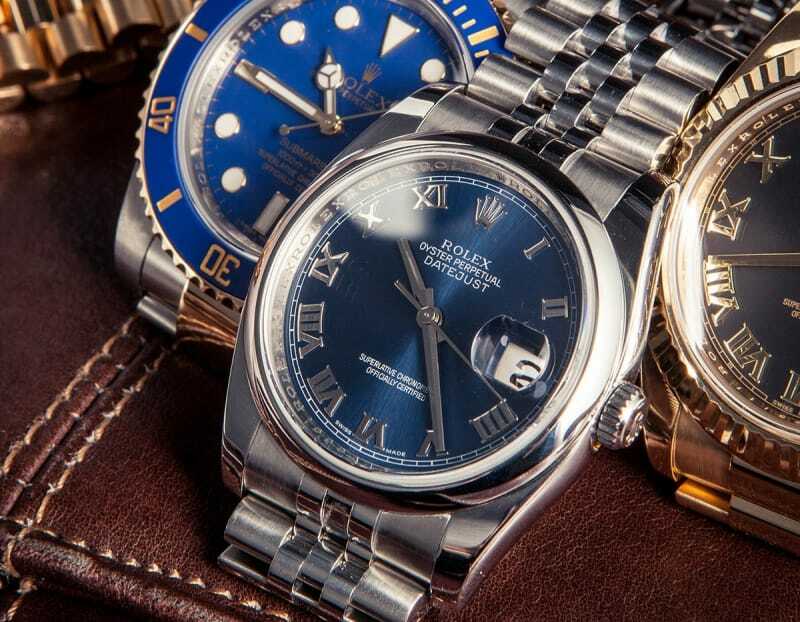 Fans of Rolex watches who wanted a big timepiece opted for the 40mm sports models like the GMT Master II and the Rolex Submariner so to address their demands, Rolex finally launched a 41mm case Datejust II in 2009 in steel and gold which also had a fluted bezel. In 2012 they introduced a smooth bezel Datejust II in all-steel. The Datejust II has a wider hour markers compared to the 36mm Datejust thus giving it a sporty look. It has plenty of luminous material applied to it although the hand markers are not as luminous and are much narrower and shorter. The hour hand can reach the hour markers unlike with the 36mm Datejust. There are also changes to the case proportions of the new Datejust – the crown appears smaller due to the wider bezel. However, it’s not without issues. For one, the wide polished bezel as well as the case seems to show fingerprints and scratches easily. The Cyclops date magnifier can magnify the date 2.5x however the date disappears when you look at it from an angle. But the good thing is that the time can be read easily. The white gold hands are very visible in spite of the low contrast against the dial which is in silver. The markers and hands are also quite legible at night. The crown is a bit small but it is easy to unscrew. The date showcases a quick-set feature and you can stop the seconds hand by way of a hack mechanism that makes synchronization accurate and easy. The Twinlock crown ensures that the watch is water resistant up to 100m so it’s ok to wear it when you’re swimming. The clasp is easy to open with its spring-loaded latch and it conceals a fold-out 5mm Easylink piece for extension. The steel bracelet is very hardy and won’t give in, unlike leather and rubber straps. The extension, which looks just like bracelet, enables you to expand the bracelet easily. The finishing and execution of the case are flawless, and the same goes for the dial, bracelet links and hands. The whole watch exudes superior quality even when you examine it closely. The inner links and sides of the bracelet show a polished finish and the outer links have a brushed-satin finish making it look even nicer. 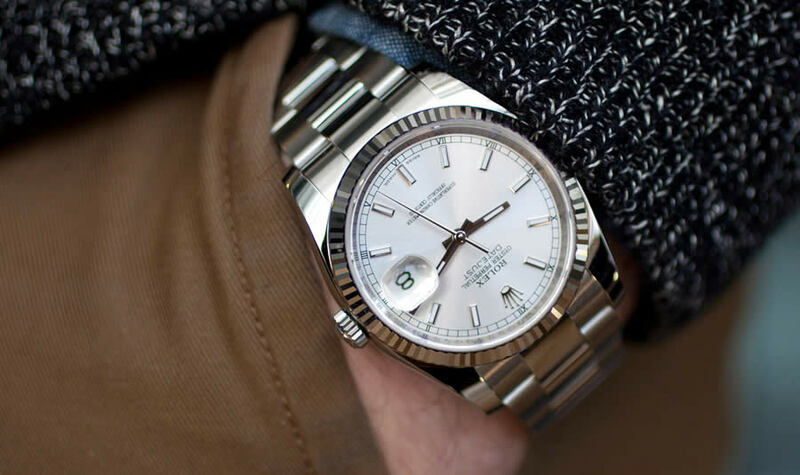 The comfort factor on the Datejust II is superb and with the smooth caseback and curved links on the bracelet you’ll never have to worry about pinching your skin or pulling the hairs on your wrist. The bracelet looks quite narrow in the part where it meets the clasp but this slenderness only adds to the comfort. The 3136 movement which powers the Datejust II is equipped with Rolex’s Paraflex shock absorbers and it was introduced a decade ago in 2005. It was built to give a 50% increase in shock resistance and to enable the balance staff to return to its original location accurately. The blue Parachrom hairspring on the movement is resistant to magnetic fields and it’s less vulnerable to shocks too. The hairspring is fitted with an overcoil to ascertain oscillation consistently. The Microstella screws which are inside the balance is a special tool to finely adjust the rate without having to take it apart. The balance bridge adds an extra layer of security and the endshake of the balance wheel can be adjusted to lower positional errors. There are no transparent casebacks in any of Rolex Oyster models but the Datejust II movement is decorated nicely with sunburst finish on the automatic bridge and rotor, beveled and polished edges, perlage on the rest of the bridges, steel components with line finishes, plus wheels with sunburnt finish and impeccably polished screws. The results of our testing of the Rolex Datejust II were as good as expected and it showed that the company has indeed regulated the watch in 5 positions, as seen in the gold-enhanced engraving notes. The 6th position was tested as well and it showed a substantially different rate than the other 5 with the highest deviation equivalent to 6seconds. The average rate is great at only 1s. When we wore it for testing, the watch worked perfectly with a gain of no more than 2.5s per day. The Rolex Datejust II has a price tag of $7,150, and it’s very competitive. The watch offers excellent and is well worth every dollar. The smaller version costs $550 less but it lacks the shock absorber and manufacture hairspring. The 41mm case size makes the Rolex Datejust very appealing to those with larger wrists or simply want to buy a large watch. The bracelet in stainless steel as well as the folding clasp are durable, nice to look at and show high-class finishing. The crown, despite the small size, is easy to use. There’s also a hack mechanism that helps in setting the time. The case has a cleanly polished surface, high quality finishing, screw down crown and impressive water resistance. It’s a sporty watch that looks elegant however the crown and hands are a tad too small. It’s easy to read the time due to the luminous material. The Cyclops also magnifies the date. The bracelet is comfy, the extension piece is a welcome feature and the caseback is smooth ensuring the wearer’s comfort. The manufacture movement is well designed and looks nice. It’s an improvement with its hairspring and in-house shock absorber. The watch movement shows acceptable deviations and low average error on various positions. The price is very reasonable for such a high quality watch.